A shuttle to Lava Point is necessary for this one-way trip that starts above 7,000 feet in the Horse Pasture Plateau. The trail wanders through stands of ponderosa pines and gambel oak with some intermittent views down into canyons of Navajo Sandstone. Lizards scamper along the trail, the birding is great, and in the early season, the flowers are plentiful. 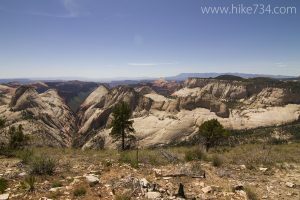 Over the next few miles, as the trail follows the ridgeline looking down into Wildcat Canyon to the west, views into the canyons below reveal fantastic features and arches. White-throated Swifts race through the air like fighter jets riding the breeze coming up from the canyons below. The trail drops down into the grassy meadows of Potato Hollow for the first campsites, then back up to the plateau. After a steady climb up, the trail forks. The left goes down Telephone Canyon with limited views, while the right continues your journey along the rim. From here on out, the sandstone canyons are delightful features with summits topped with miniature forests. Along this rim, you’ll pass a number of campsites counting down as you descend into the canyon. Once past the last campsite, you’ll begin the descent, almost a thousand feet, into the canyon via a trail scored into the rock that switches back and forth along vertical walls. It’s as beautiful as it is fantastic as it leads you down onto the slickrock. 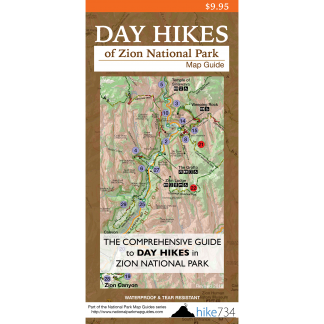 You continue to work your way to Zion Canyon across the mesa where, at a point, the trail dissolves into a series of signs with hiking boot marks along solid rock directing you towards Scout Lookout. Approaching Scout Lookout brings you along the precipitous cliffs that drop down to the Virgin River, responsible for these impressive cliffs. From here the river and the road snake below you, swifts and falcons fly at eye level, and canyon walls tower around you. From Scout Lookout, the hike continues its descent via Walters Wiggles, unique switchbacks hewn into the rock, into the cool and aptly named, Refrigerator Canyon. After the canyon, the views open back up as the mostly paved trail follows along the cliffs, then switchbacks down, eventually getting into vegetation and along the valley floor. A footbridge takes you across the Virgin River and to The Grotto where you can hop on a bus. Trailhead: In the town of Virgin, UT, take the Kolob Terrace Road north to Lava Point Road past the Wildcat Canyon Trailhead. Turn right onto Lava Point Road and then a left at the junction on West Rim Road. Arrangements can be made in advance with one of the shuttle services in Springdale to take you to the trailhead. The trail ends at the Grotto, allowing you to use the Park’s free shuttle back into Springdale.